The time has come to refresh our security tool arsenal – BackTrack 5 R3 has been released. R3 focuses on bug-fixes as well as the addition of over 60 new tools – several of which were released in BlackHat and Defcon 2012. A whole new tool category was populated – “Physical Exploitation”, which now includes tools such as the Arduino IDE and libraries, as well as the Kautilya Teensy payload collection. Building, testing and releasing a new BackTrack revision is never an easy task. Keeping up-to-date with all the latest tools, while balancing their requirements of dependencies, is akin to a magic show juggling act. Thankfully, active members of our redmine community such as backtracklover and JudasIscariot make our task that much easier by actively reporting bugs and suggesting new tools on a regular basis. Hats off to the both of you. We would like to thank Offensive Security for providing the BackTrack dev team with the funding and resources to make all of this happen. Also, a very special thanks to dookie, our lead developer – for building, testing and packaging most of the new tools in this release. Lastly, if you’re looking for intensive, real world, hands on Penetration Testing Training – make sure to drop by Offensive Security Training, and learn the meaning of “TRY HARDER“. 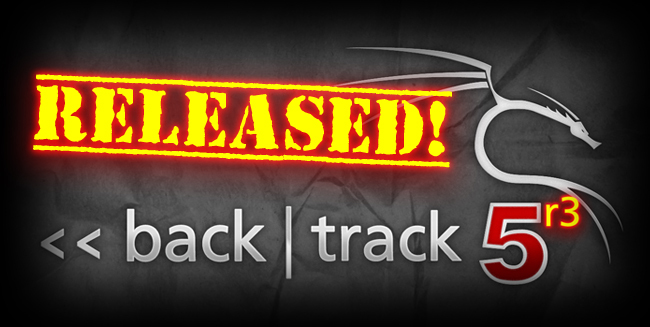 For the insanely impatient, you can download the BackTrack 5 R3 release via torrent right now. Direct ISO downloads will be available once all our HTTP mirrors have synched, which should take a couple more hours. Once this happens, we will update our BackTrack Download page with all links.